The patient is asked to close the eyes. Tears in the conjunctival sac will cause progressive wetting of the paper strip. After 5 minutes, the filter paper is removed and the distance between the leading edge of wetness and the initial fold is measured, using a millimeter ruler. The website is correct, the comments are wrong. 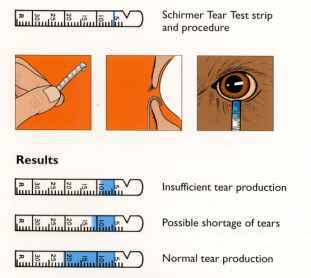 From OphthoQuestions: Schirmer tests are without anesthetic. In Schirmer II the nasal mucosa is stimulated. <15mm is abnormal in Schirmer II. <5mm is abnormal in Schirmer I and 5-10mm is ambiguous. Schirmer III is after DCR. The Basic secretion test is WITHOUT anesthetic. cnk is correct, according to BCSC. Basic secretion is with anesthetic and normal is >10. Schirmer 1 tests basal secretion without anesthetic and normal is > 10. Schirmer 2 tests reflex secretion and is without anesthetic with nasal stimulation and normal is >15.